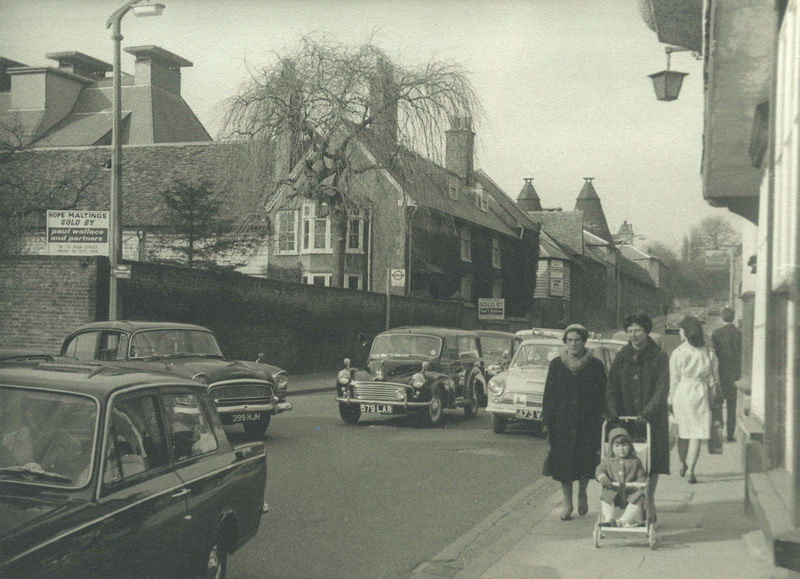 Corner of Coronation Road and Baldock Street, 1966. The Wagon and Horses was run by R Easton in 1958. The Hope Maltings and Maltster's house opposite The Old Bull's Head. The buildings were demolished in 1969. Mr. Brooker’s comment below, is very interesting to me, because his span of years mentioned ( 1962 to 1970 ), perfectly encompass the years 1964 to 1970, when Mr. Timmons would have run this Morris lorry for his green grocery business opposite to Robinson’s. Probably using the same storage yard between buildings, opposite to Robinsons. I wonder whether he remembers the vehicle which at that time was in a strange pinkisk manufacturer’s primer. Also, the trading name of Mr. Timmons’ shop would be good to know. 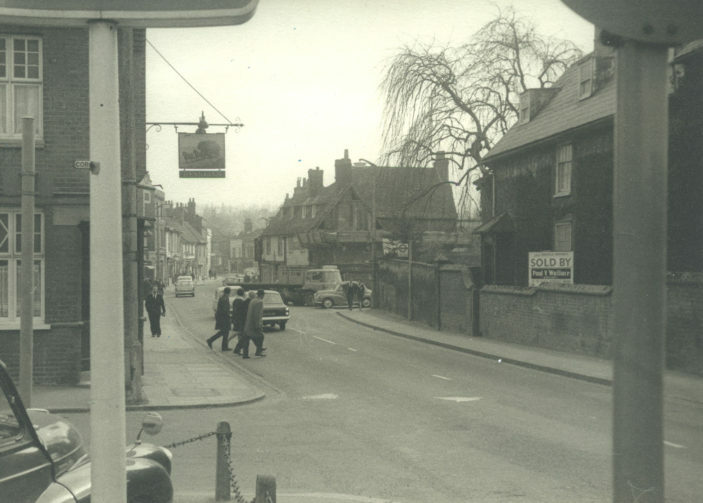 The barrow in the road on the left, belonged to Robinsons greengrocers shop owned by Len Robinson. I pushed that barrow from the shop’s store across the road, hundreds of times in the period that I worked at the shop as a schoolboy and student from 1962 until 1970, when I left Ware to live in Southampton. I own and show, a lorry that is a replica of my earlier lorry, owned from new by Stuart Timmons of the greengrocer where Mr.Romeo is now, in Baldock Street, Ware. Does anyone have any photographs showing this lorry – BNK592B ? The green grocers shop was owned by the Bell family. In the 1950’s The Café was called ‘The Maple Leaf Cafe’. 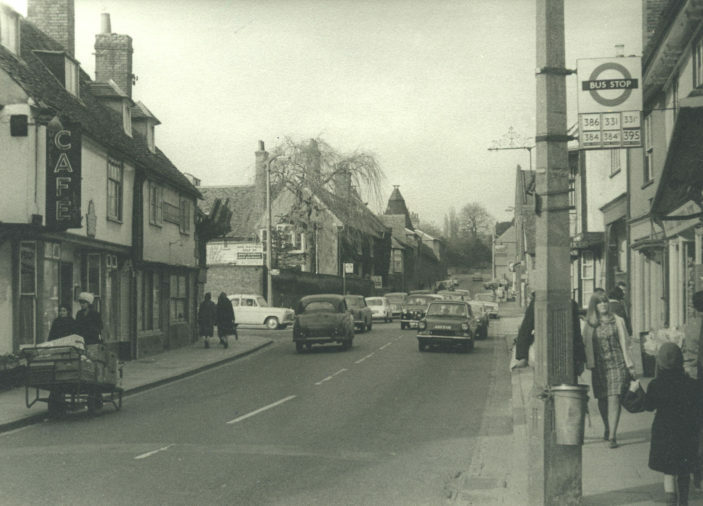 Next to it, to the right, was a greengrocer’s and on the corner was ‘Moss’s’ bicycle shop.